Awards bring more enjoyment to contests. Participants earning first place in the NM QSO QSO Party’s operating or high score categories will receive a plaque that’s suitable for hanging proudly in their shack or club house. Winning multi-op teams will receive a single plaque to share amongst their team. If a plaque for a particular category does not have a sponsor by the time logs are scored, a color certificate will be awarded. The New Mexico QSO Party welcomes individual hams and amateur radio clubs to sponsor a plaque for one or more of the available categories. If you would like to sponsor a plaque, a small contribution of $25 will cover its cost ($19 for the plaque, $6 for packing and shipping). Sponsors will be recognized on the New Mexico QSO Party website as well as directly on the plaque they sponsor (see picture below). Any residual sponsorship funds, after all plaques have been purchased and delivered, will offset NMQP administrative expenses (web hosting, domain name renewal, etc.). 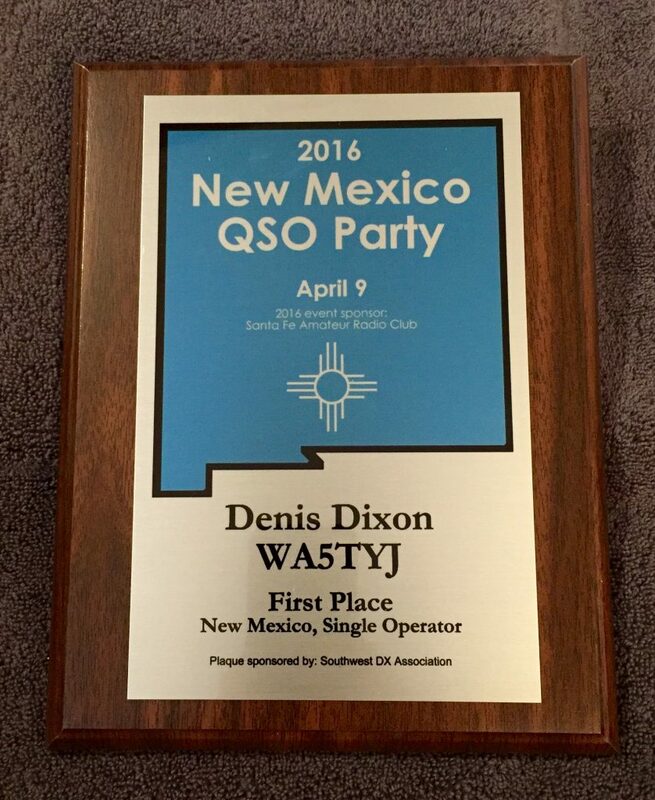 If you’re interested in supporting the New Mexico QSO party through the sponsorship of an award, please contact us.